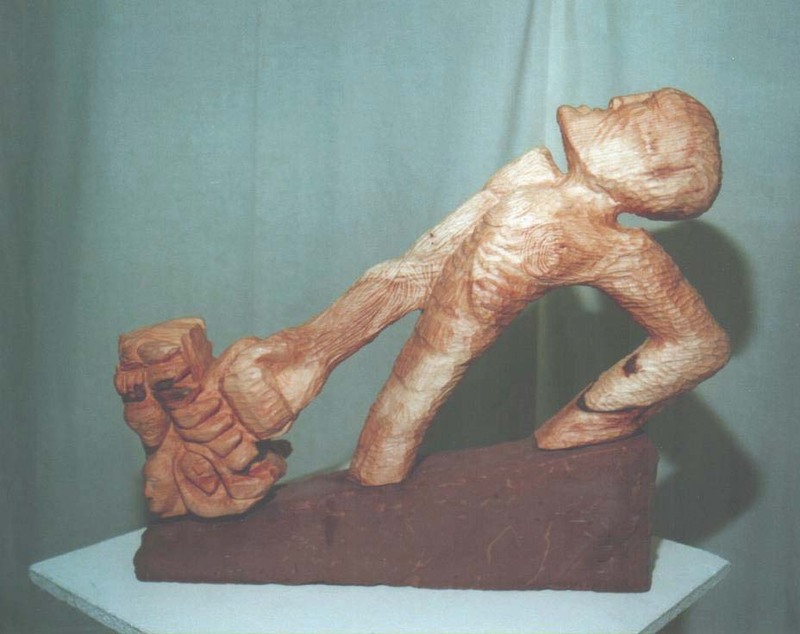 I have produced a variety of sculptures in different materials. The first series of work pictured here are from the 'Journeys' exhibition held in The Lagan Lookout. 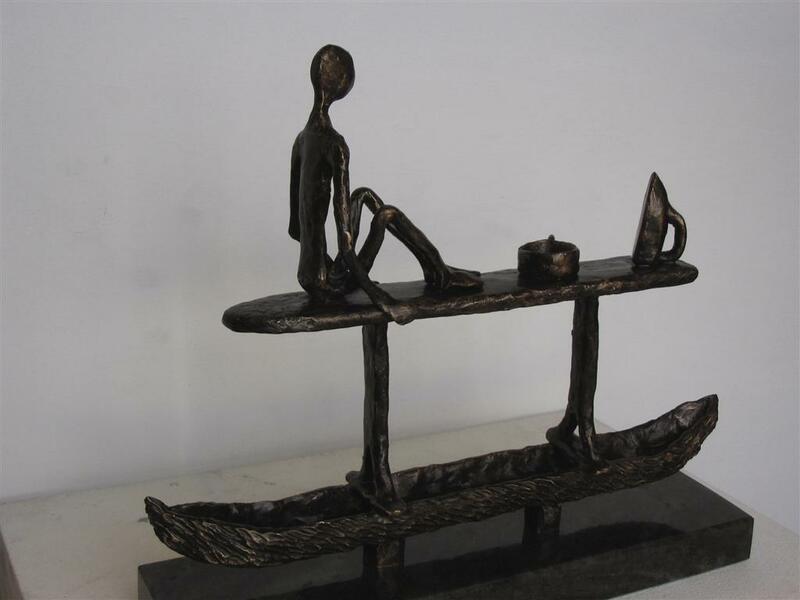 This took as its theme water bound journeys as a metaphor for exploring many issues. Following that is a series of work based around the 'Hands of History' The center piece for this exhibition is the bronze casts of the party political leaders who negotiated the Good Friday Agreement - placed around it are images exploring various issues that are connected with the conflict in Northern Ireland. Although this work was inspired by the NI situation I have exhibited and discussed this work in front of a number of international audiences who clearly identified with the issues and images - conflicts around the globe share similar elements and characteristics. 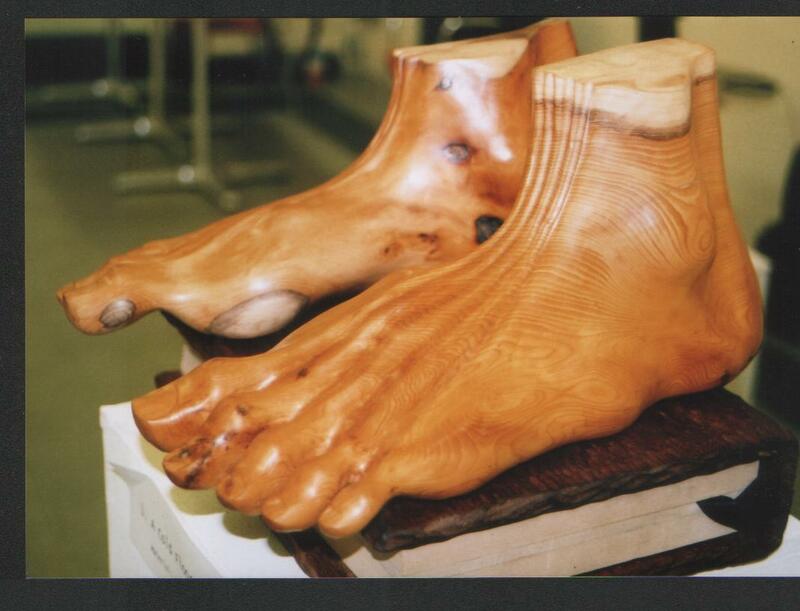 *Click on any of the Sculpture images to view them at full size. 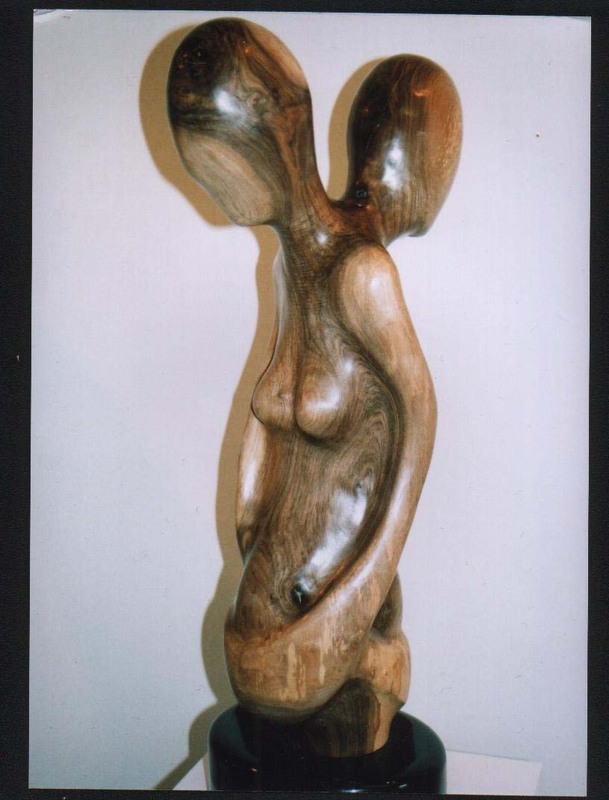 This piece portrays a pregnant woman in a long narrow boat. 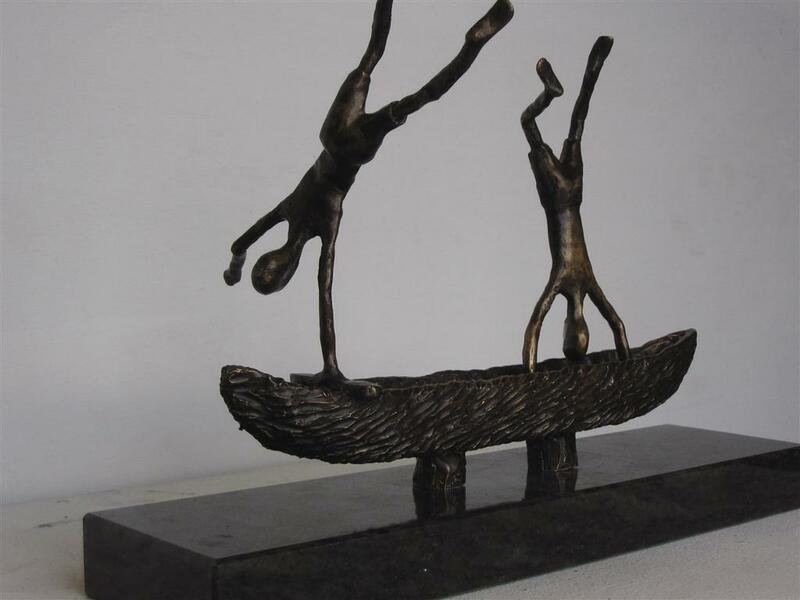 Portraying two children doing cartwheels on a boat, exhibiting the free nature of children in contrast to the confining protectiveness of adults. 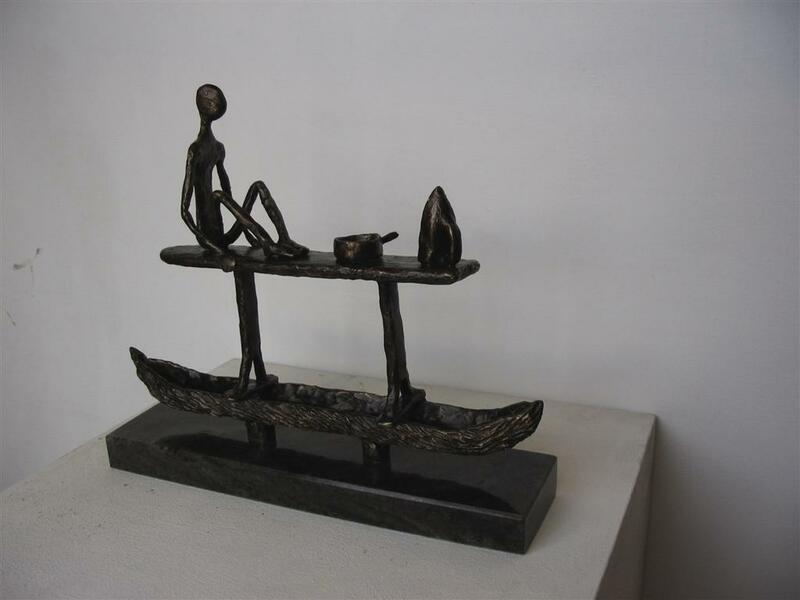 A naked man perched on an ironing board and balanced on a narrow boat, contemplates an iron and a pot. 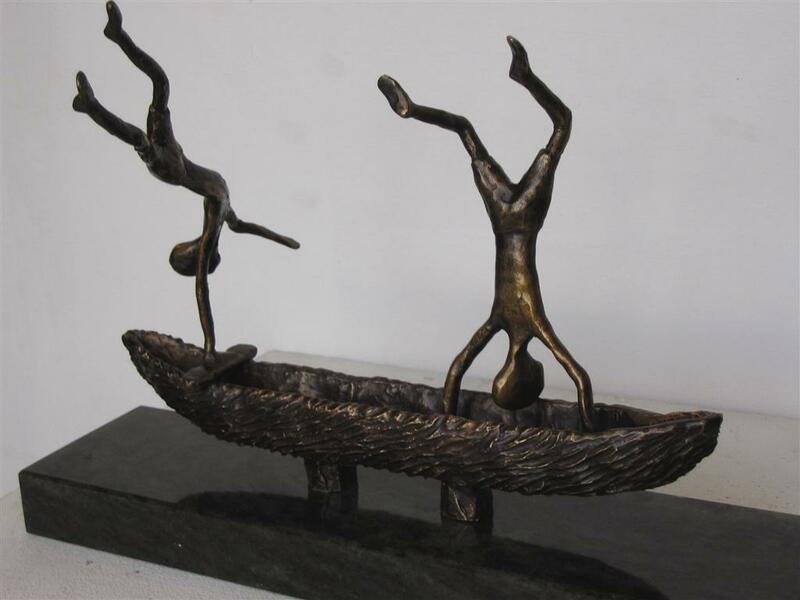 The sculpted element represents the figures who may have immigrated through famine or otherwise - the bronze sails represent the poverty and hope they hoped to find. 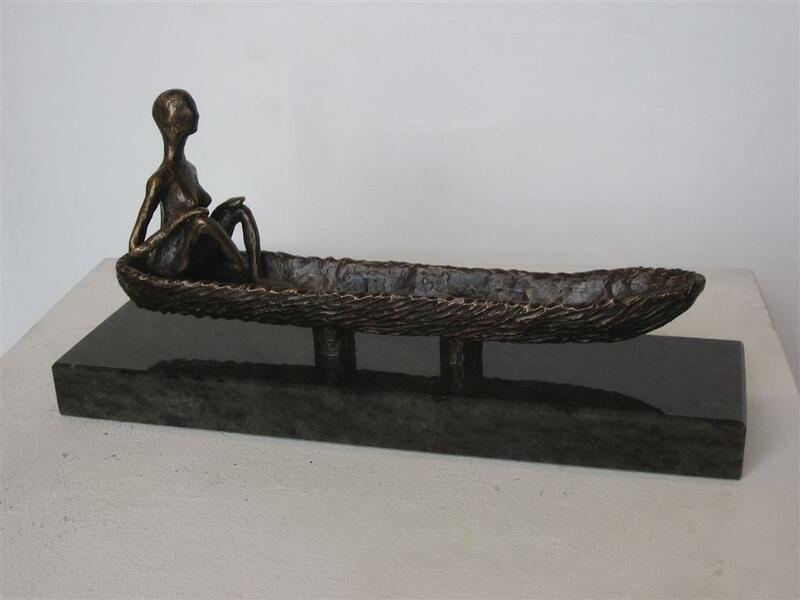 This piece represents the scenario of early man journeying by water and the senses that he may have relied upon. 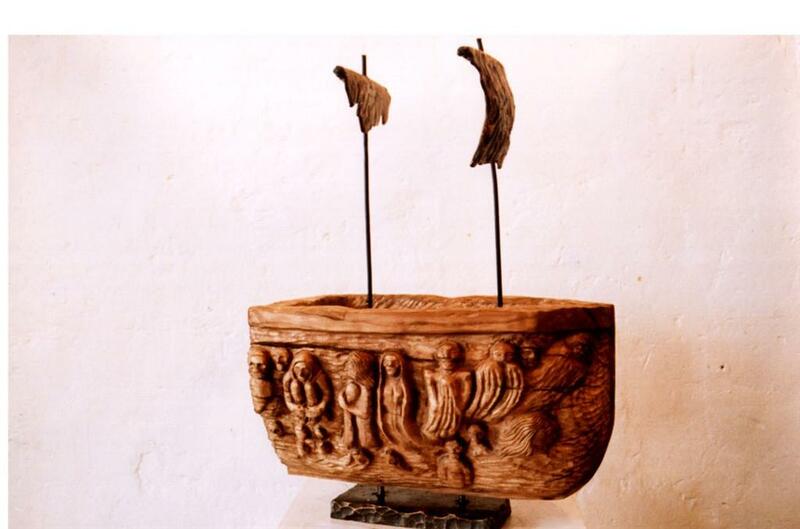 Sculpted on the side of the boat are images of tools and the five senses. 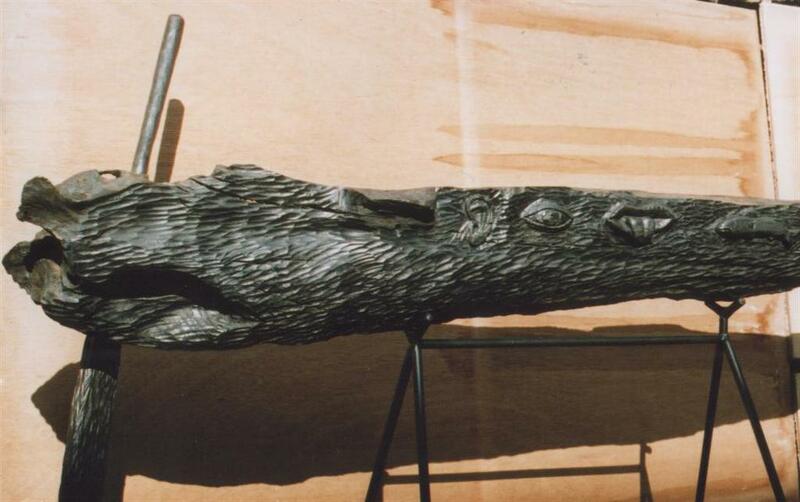 A commemoration of the original Broighter Boat. 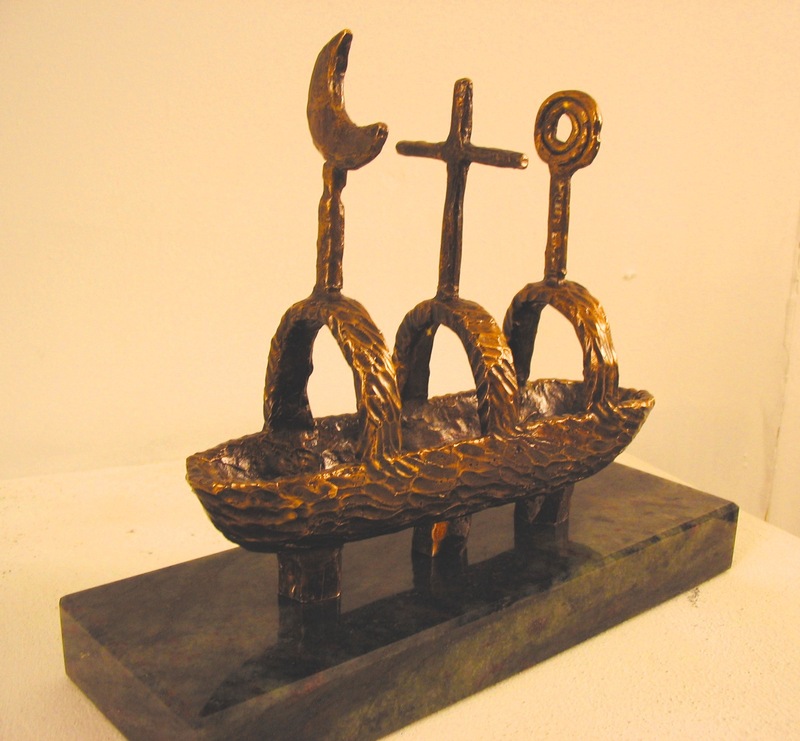 This boat represents pagan, Christian and Muslim travelling together. 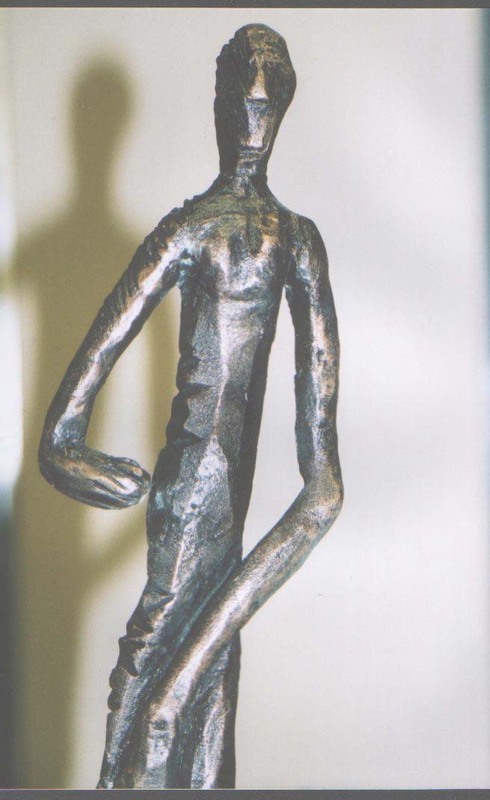 The centre piece for this exhibition is the unique and historical Hands of History. 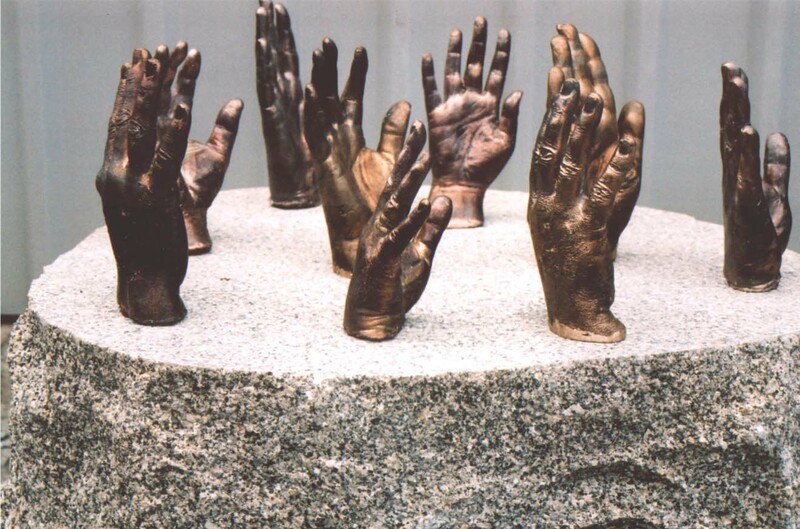 This sculpture is an artistic record of the aspirations of those British and Irish political leaders who negotiated the Good Friday Agreement. 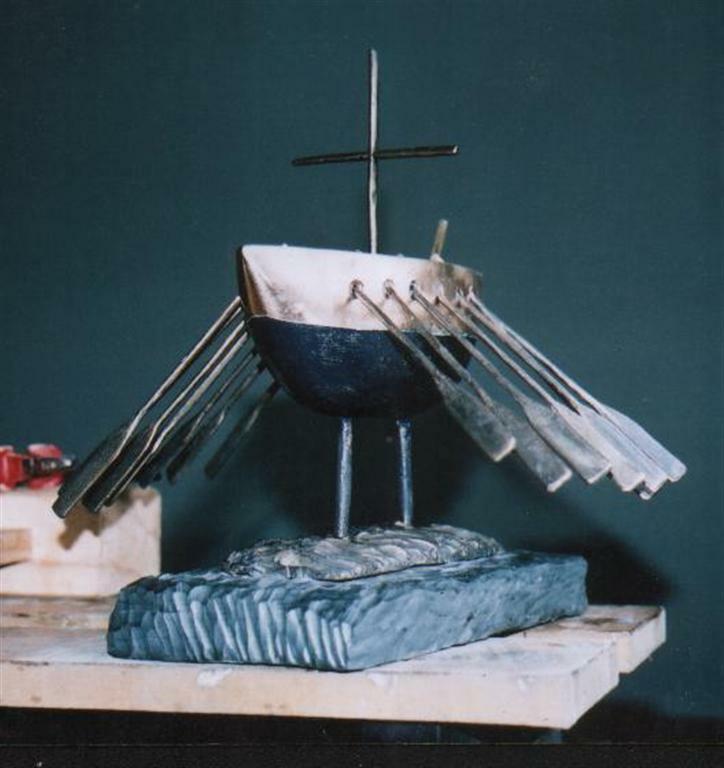 The other sculptures give this centre piece a context by taking the spectators on a journey that critically explores many important cultural and political issues. 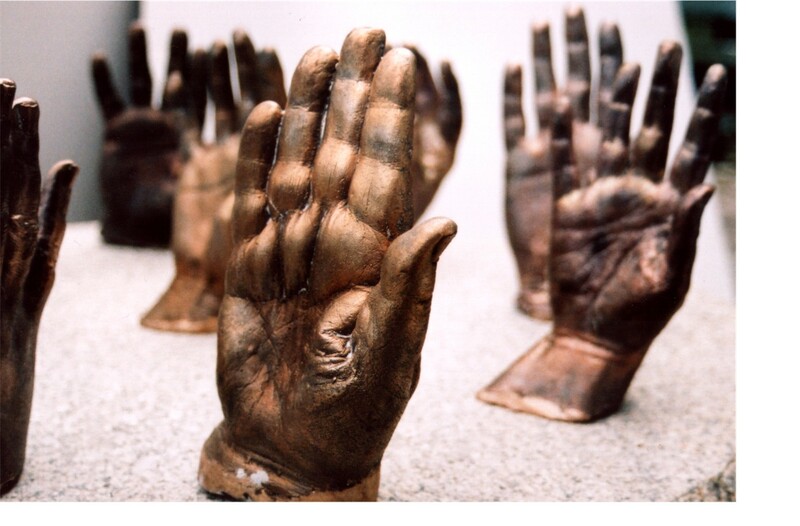 Although the sculptures in this exhibition are inspired by the local situation they have a wider global resonance. The themes of nationalism, culture, religion, fundamentalism, history and politics are key components in conflicts across the globe. In the mid 1990’s eight Northern Ireland (NI) political parties negotiated and agreed to implement a new political process based on the text of the Good Friday Agreement. Over a period of more than 18 months I cast the hands of Northern Ireland’s political leaders who negotiated the document that became the Good Friday Agreement. Those cast are: David Trimble, UUP, Gerry Adams SF, John Hume SDLP, Malachy Curran NILP, Monica McWilliams NIWC, David Irvin PUP, Gary McMicheal UDP, Sean Neeson ALL. The British Government is represented by Mo Mowlam the then Secretary of State. I subsequently attached the hands to a large piece of Mourne Granite. The Stone: In ancient times there was a sense of immense power and permanency about a large rough shaped rock. In mythology and in contemporary times ordinary people, chieftains and monarchs touched or sat on a stone to pledge themselves to a better future. 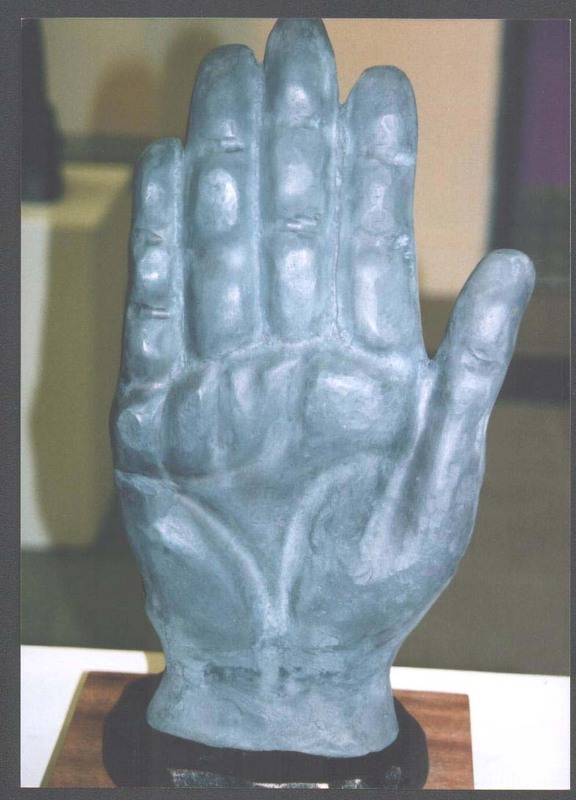 The Context: The other pieces in this exhibition give the Hands of History a real and meaningful context; they critically reflect and recall aspects of mythology and history that have impacted on our community and on all of our lives. 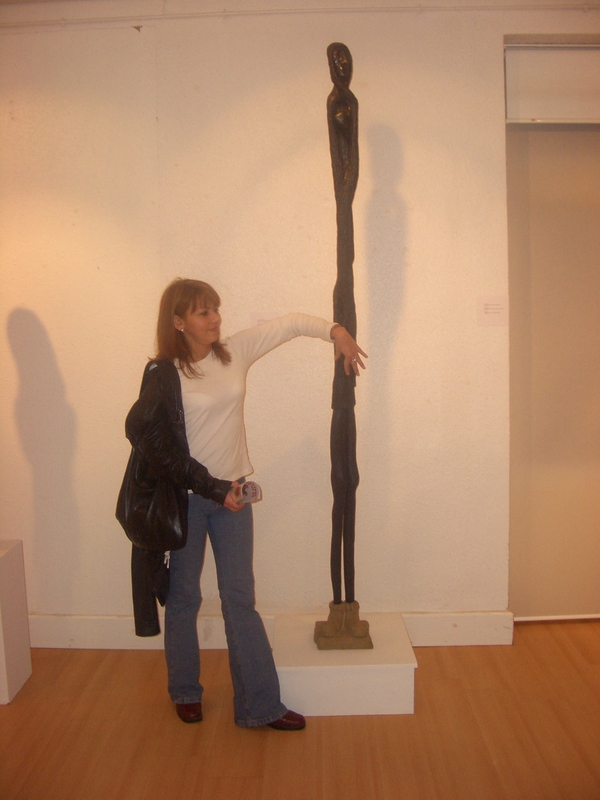 In the following pieces I have used various materials that enhance the theme of the piece. 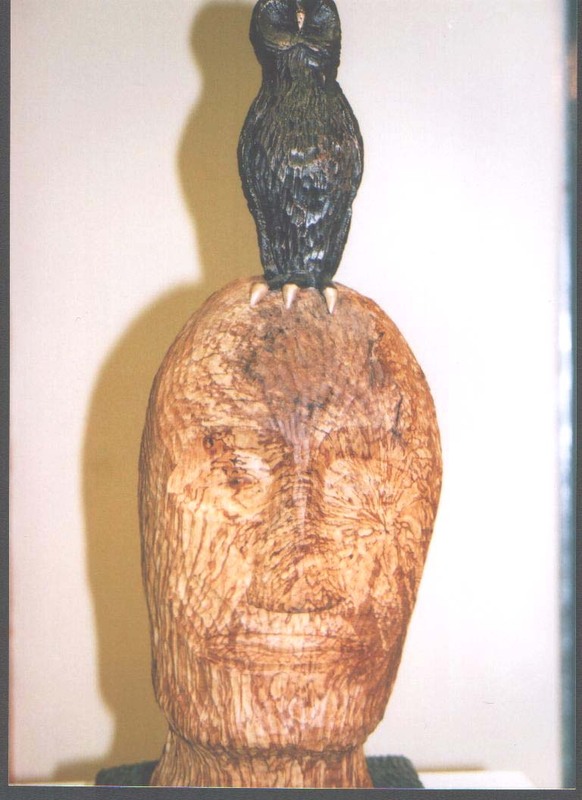 For example: The Weight of History has a small bronze owl on top of a piece of spalted beech. An owl is seen as a bird of wisdom but also as a bird of prey - this is history it can be destructive and a force for good depending on how we treat it. The Red Hand series is made from a range of material from fresh oak to solid lead. 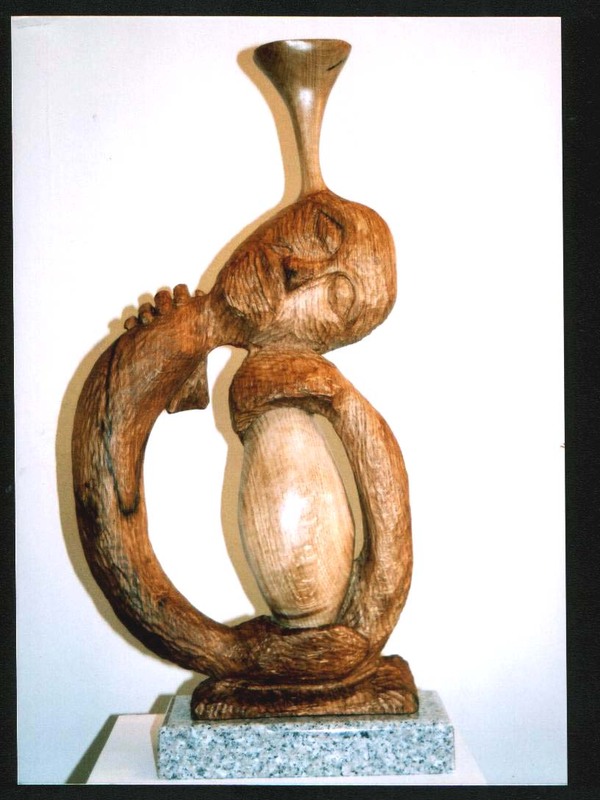 The fresh oak symbolises the solid nature of an innocent mythical story, the other images are what we do with the story, and finally the Lead Hand is something that will perform the same function as a dead weight. 1. 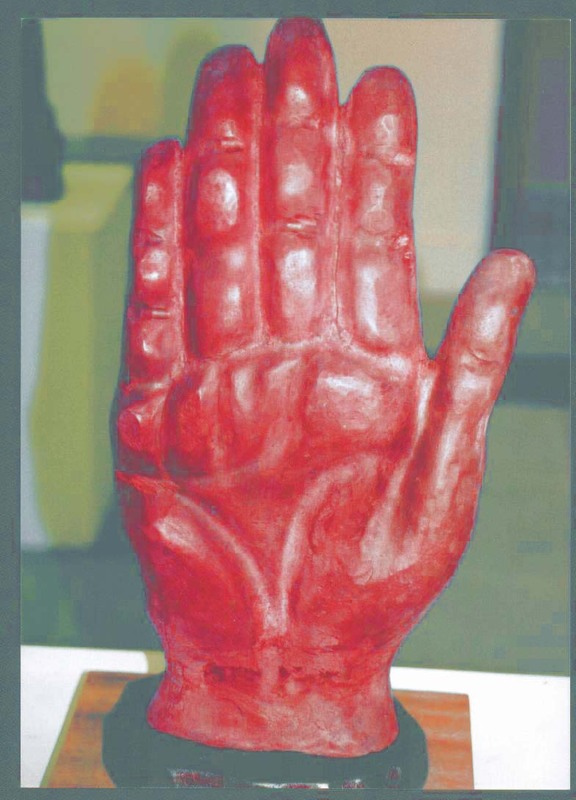 Red Hand The Myth, oak 2. 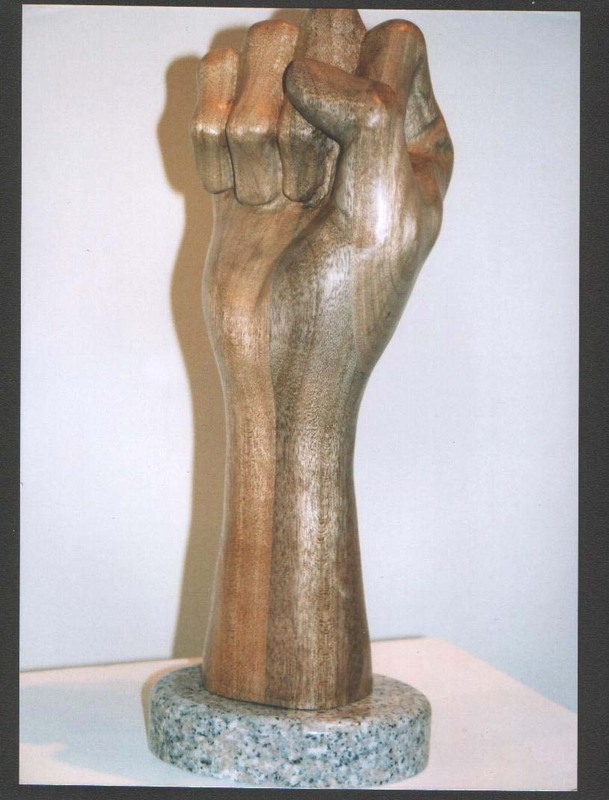 The Symbol, mahogany 3. 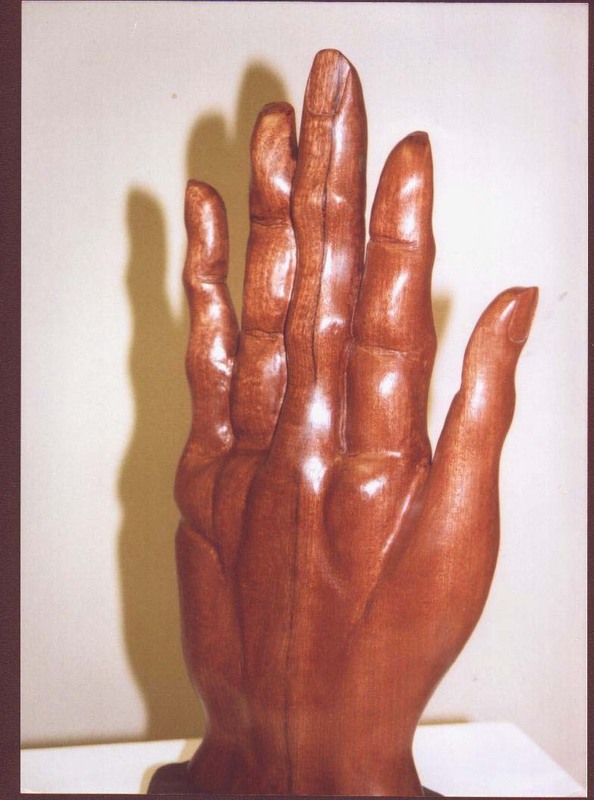 The Other Symbol, mahogany 4. The Fecked up Symbol, mahogany and 5. The Lead Hand of Ulster, lead. ps. Red hand 2. 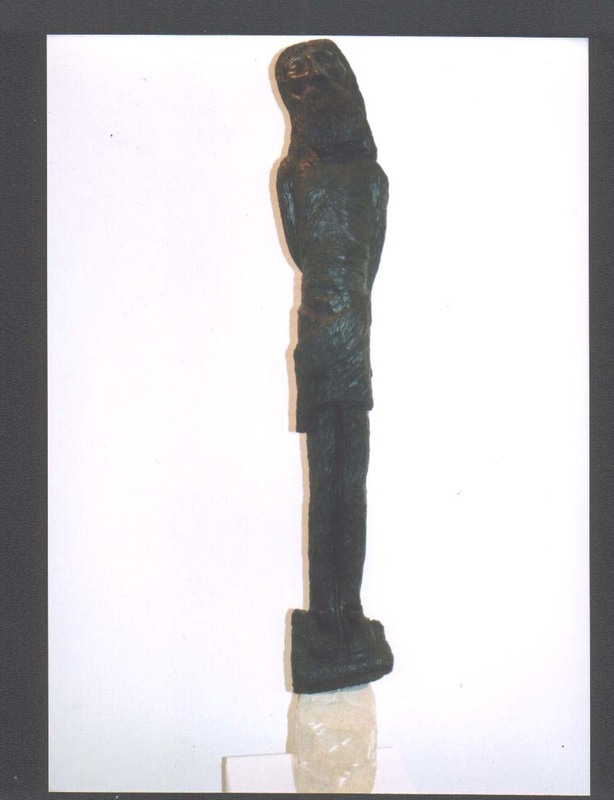 'The Symbol' was stolen while on exhibition in the James Joyce House Dublin. 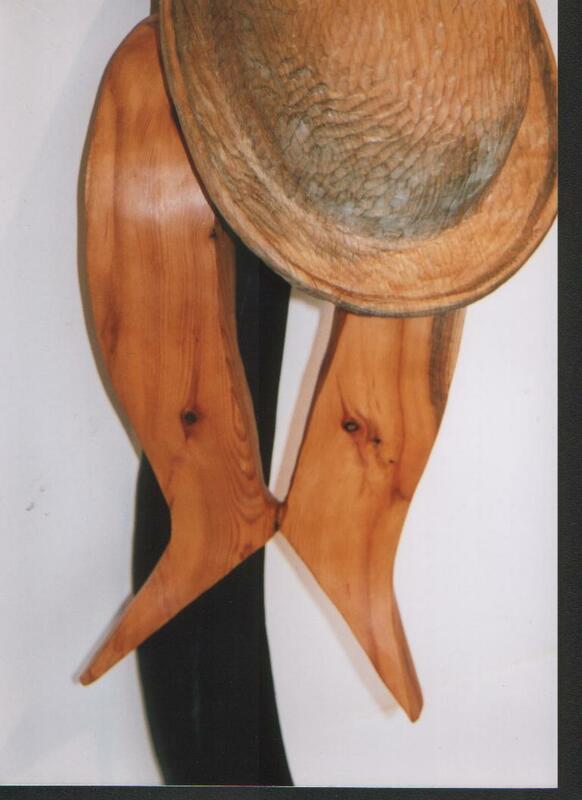 Material: Bog oak sword, yew sash, and oak bowler hat. A comment on the marching season. A comment on the security found within traditional belief systems. The anguish of a parent who witnessed the loss of a loved one. An expressive comment on the struggle for political movement in Irish politics. 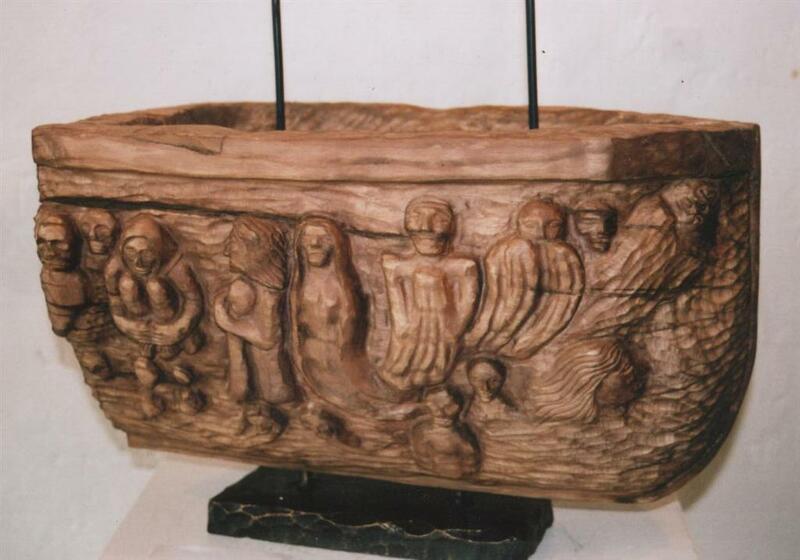 Material: Oak and Mourne Granite.